It’s a fairly minimalist game. You start out in a universe with seven other players and try to take over the universe. They’ve setup the game so that it’s really hard to get a large advantage over other players in the game. I should explain the rules in order to illustrate what I mean. * You begin the game with 60 ships and four stars (your home star being the most important). * Each star has an economy, industry, and science level (which can range from 0 to infinity). * For each point of economy, your empire earns $10 per day. * For each point of science, your empire produces 6 research points per day. There are four types of technology in the game: range (how far your ships move without landing in a star system), speed (how fast your ships move), weapons (the attack power of your ships), and scanners (how far your star systems can detect enemy ships). Each technology has a level. You start out at “level 1” for each technology. In short: there isn’t any complicated technology tree. It became apparent that the best strategy was a mixture of improving your economy, industry, and science. If you have no immediate enemies, you can expand a little better and go a little heavier on economy (to build up more money to buy other stuff later). If the first player moves in and attacks, he’ll be able to take-over the second player’s territory, but then he’ll have twice as much territory to control and he’ll be down to 50 ships (which would make him the weakest player in the game with a large valuable territory – making him vulnerable to attack from other players). This means you need to work with other players. For example, two weak players who are allies are actually more powerful than a strong player. Add in the fact that communication between players is secret, and it creates a lot potential for treachery. One interesting pitfall I saw in my game is “Overreach”. I saw one strong player get involved in a two-front war. 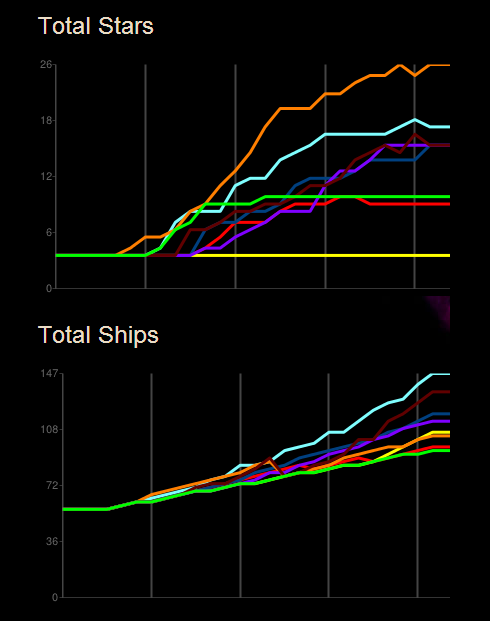 In terms of stars under his control, he was the top player for a while, but the wars depleted his ship-count. He ended up as an underdog. The problem of overreach is a direct result of the game rules about ship production – it’s difficult to produce a lot of ships, and difficult to replenish them after they are destroyed in combat. It also illustrates the fact that two weak players are stronger than one strong one. You can’t get too cocky in this game because you can quickly switch from “being a top player who’s winning a war” to “being the beleaguered has-been who’s losing a war” if a second or third player decides to attack you. You might think you can fight a two-front war, but the rules make it difficult for one player to get stronger than two players combined. If you aren’t careful, you can blunder into a Pyrrhic victory – i.e. you might capture a valuable star from the enemy, but you’ve lost so many ships in the process that you’ve opened yourself up to attacks from other players. I’m the dark blue player near the middle (the lines around my stars indicate my sensor range). I was sandwiched between the red, orange, green, and cyan players. The green player to my east was a novice player who didn’t seem to know what he was doing. He was weaker than me, but not significantly. He was blocked out of the game unless he was willing to attack me. He had no options for expansion and no options for attacking other players. This made me suspicious about him. To my south is the cyan player. He was a strong player – he expanded well, had played the game before, and was pushy when he communicated to me. At one point, he tried to bully me into giving him a star system, saying that I couldn’t afford to get in a war with him because everyone around me would attack if I got in a war with him. He generally came off as a pushy jerk. The yellow player never showed up to play the game, so cyan didn’t have to worry about the yellow player at all — and he could expand into that territory without competition from yellow. Cyan was incredibly lucky with his starting position. The red player to my west was in an even worse position than I was. He was surrounded by other players, making him an obvious target. 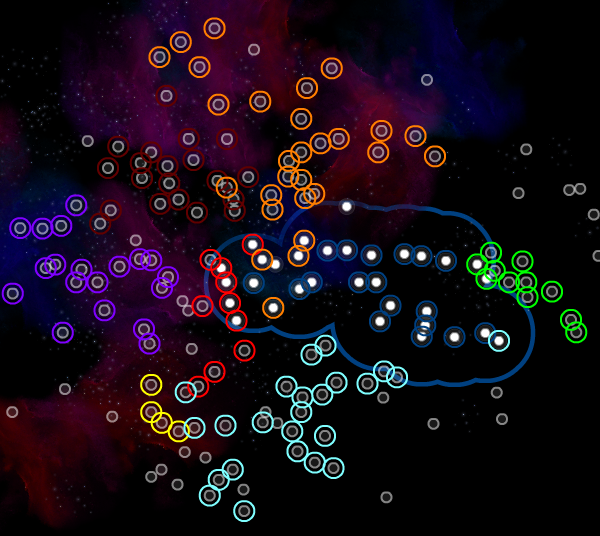 Glancing at the galaxy map, it’s clear that the best starting positions were held by cyan, purple, and orange. All three of them had lots of territory to expand into. Cyan had a deadbeat neighbor (yellow), and one potential enemy (me). Purple had a deadbeat neighbor (yellow) and two potential enemies. Orange had one potential enemy (dark red), but for some reason ended up fighting both dark red and light red. It wasn’t surprising that orange and cyan ended up being the strongest players at one point in the game, though orange got involved in too many wars and ended up faltering. * Attack the red player (to my west) – If I won, this would put me even further into the middle of the board, which would make me a more obvious target for all the players in the game. * Attack the green player (to my east) – I realized early in the game that the green player had no real options except to attack me. He’s backed into a corner. I talked to him a bit and learned he was a very novice (and rather incompetent) player. He suggested working together in an alliance – he would help me somehow (though neither of us were familiar enough with the game to know how exactly he could help me). 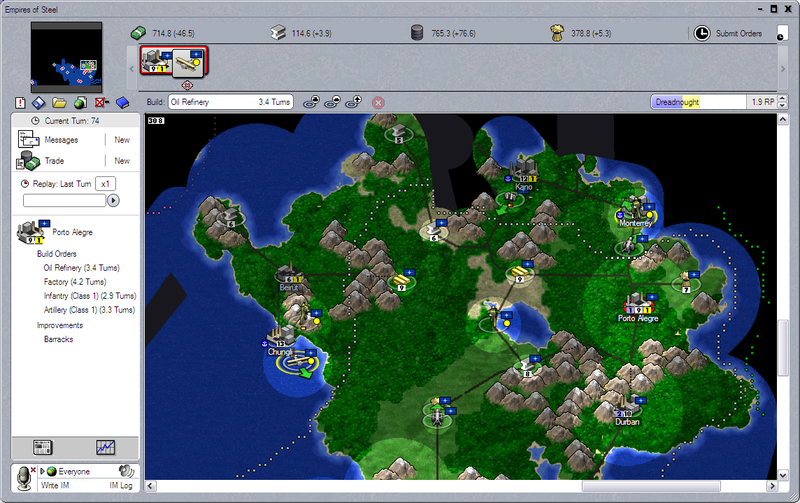 I was afraid that attacking green would give cyan (to my south) a chance to invade my territory. Cyan had no enemies at all. I could probably take green (since I was stronger than he was), but it would deplete my fleet and cyan would be dumb not to attack me. * Attack the cyan player (to my south) – Cyan was a strong player with no enemies. I figured I would lose a war against him. Plus, any war against him would open me up to attack from other players (green in particular). * Attack the orange player (to my north) – Orange was a strong player. His stars were quite a distance away, though, meaning I’d have to stretch my fleet out over a long distance. I’d also be vulnerable to attack from green and cyan if I got involved in any war with orange. Since I was between four different players, I generally felt boxed in. I couldn’t really attack any players without giving the other players (particularly green or cyan) an opportunity to attack me. As a result, I mostly just camped in the game. I kinda felt screwed by my starting position. Honestly, my best option was to either trust that green would honor our alliance if I started a war with cyan (which I’d probably lose anyway since cyan was strong), or to attack green (who was weaker than me, but cyan would likely attack me, causing me to lose the game). Even worse, it was obvious that it was in cyan and green’s interest to gang-up against me. Communication – You need to talk to other players a lot. There’s no way you can win the game without it because there’s no way you can build up an empire on your own and take the other players. The game makes it difficult for players to build (and rebuild) their military and all players are roughly at the same level of power, so you’ll get destroyed if you’re fighting a lot. If you’re good at talking and making alliances, that skill will come in handy. I communicated a great deal with both green and cyan – it’s the only thing that kept them from attacking me, though I felt like I was only delaying their attack since it made strategic sense for them to attack me. * The game is simple enough that you should be able to quickly figure out how to play decently. The tutorial is helpful and will get you up and playing the game quickly. It occurred to me that games with simple rules are good for multiplayer games – it allows anyone to showup and play. If a game is very complex, then the winners and losers will be determined based on skill-level (which means spending lots of hours learning the game). I was able to get a good grasp on the game within a few days. Admittedly, some mistakes I made in the first 48 hours hurt me, they weren’t so devastating that I was out of the game. * It generally felt like you needed to fully analyse your situation and other player’s situations in order to play the game well. You couldn’t really go on autopilot with a rote progression of actions and win the game. I liked the dynamic feel of the game. * I liked the fact that communication played such a crucial role in the game. In a lot of strategy games, winning depends on other aspects of the game. I think part of the issue is that many strategy games use AI players, and AI players are not good at communication. As a result, communication and persuasion are designed to play a minor role in strategy games. Effectively, the capabilities of the AI are guiding/limiting the structure of the game. * The game world is persistent and the game takes place over a week or more. This might be a plus for people who don’t have a lot of time, but the problem is that enemies can attack anytime. This means it’s useful to checkin frequently to see if anybody is sending a fleet your way. If you want to sleep, you just have to accept the fact that people can attack you during that time. They generally won’t be able to actually reach one of your stars in eight hours, but they can get far enough that you won’t have time to scramble an adequate defense. I found this aspect of the game to be stressful. * The game is too affected by your starting position. In the game I played, the player to my south was lucky enough to have a lot of stars within reach and a player (yellow) who never showed up to play. I was the only player who was a threat to him, and I happened to be placed near the middle of the map (which means I didn’t really want to start any fights, since I bordered on several players). This gave him a great starting advantage. He ended up quickly establishing himself as the top player. * The game is minimalist, so if you’re looking for an in-depth space conquest game, this isn’t it. Neptune’s Pride is essentially “Risk” in space. * The game often rewards stabbing your allies in the back. I didn’t care for this aspect of the game. It felt a little bit like the TV show “Survivor” – where people were always making secret alliances and backstabbing each other for a chance at a million dollars. I felt like I always had to watch my back, and I hate backstabbing my allies. Double-crossing an ally just makes me feel crappy. I like my allies to be allies and know who my enemies are. At one point in the game, I became convinced that the two players (green and cyan) were plotting against me, even though I had formed an alliance with green early in the game. I was watching their technology progress closely, and I noticed a series of technology advances that convinced me that they were exchanging technology between them. I don’t know that for sure, but it would make strategic sense for them to gang-up on me, and it was hard to explain their lockstep technology advances. (Players can communicate by sending messages to each other. These communications are secret, so you have no idea if two players are making plans together.) If you’re into secret alliances and backstabbing, this aspect of the game might be a positive. I will concede that it was cool that wheeling-and-dealing can have a major effect on the outcome of the game. If you’re good at communicating and forming alliances with other players, it’s a big advantage in the game. * If someone’s losing a game, they’ll just abandon the game. There’s an AI that will takeover their empire, but it just turtles. At some point, I knew I couldn’t actually win the game, and I couldn’t attack anyone without inviting other players to attack me. I felt guilty when I considered leaving the game because it hurts the experience for other players. After about 10 days of (uneventful) play, I had to leave to a music festival so I had to drop out of the game. I wasn’t sorry to abandon my game. I was glad I had an excuse to leave. This is one of the downsides of multiplayer games: other people will abandon the game when they know they’re losing (which hurts the enjoyment for other players), and I feel guilty about abandoning it (meaning I end up continuing to play even after I’ve ceased having fun). I hope single-player strategy games continue getting made because I have no guilt dropping out of a game if I’m just playing against AI players. Would I play this game again? No. I didn’t really enjoy it all that much, though I could understand if people really enjoyed it. I did enjoy taking a look at the game (for the first few days) and seeing how they structured the rules and game balance, though. This entry was posted in Game Reviews by Brit. Bookmark the permalink.